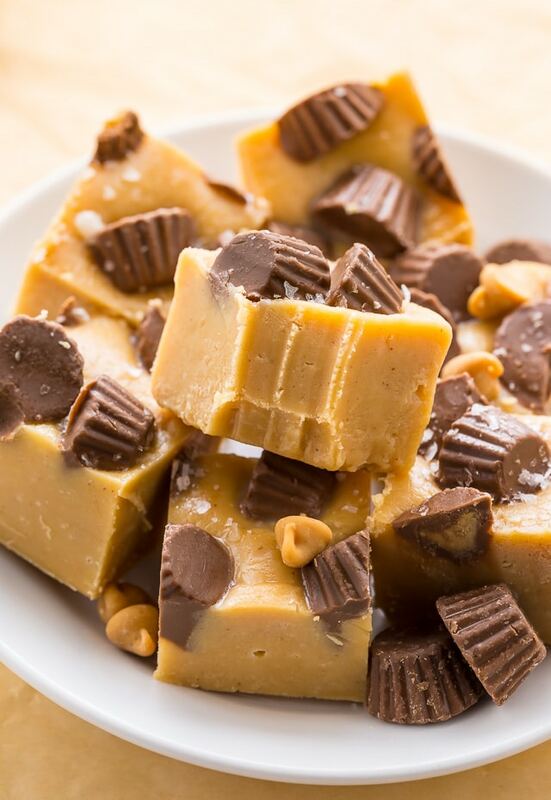 A foolproof recipe for easy peanut butter fudge! 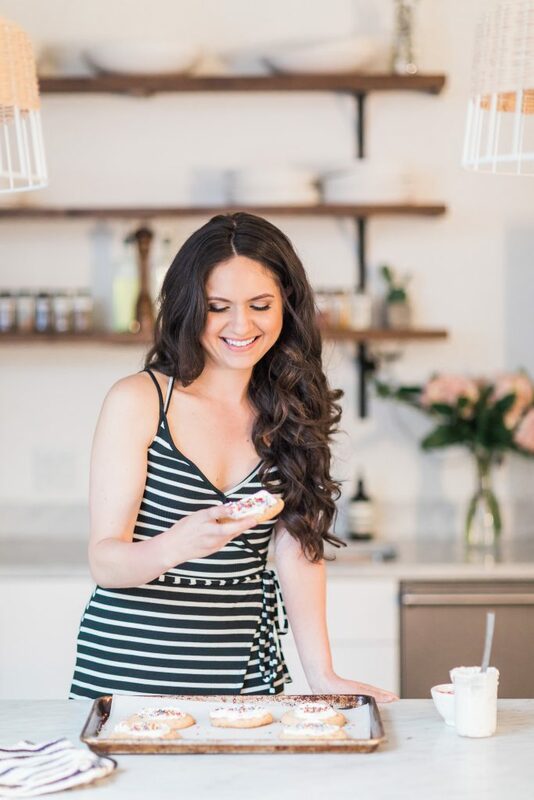 Friends, how long has it been since we’ve shared a peanut butter recipe together? Answer: too long! 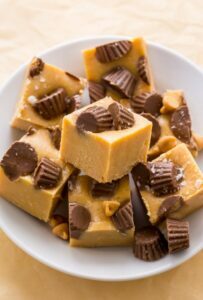 So to make it up to you, I’ve made you some easy peanut butter fudge that’s rich, creamy, and SO decadent. But the best part? The best part is this is a no-bake recipe! Or wait, maybe the best part is this is a one-bowl recipe? I can’t decide! and takes less than 20 minutes to assemble! Because I wanted this recipe to be quick and easy, I use peanut butter chips instead of actual peanut butter. This may sound a little strange a first… but I assure you the chips give the perfect amount of peanut butter flavor! Plus, they don’t leave a greasy residue, which I found happened all too often when I tested the recipe with peanut butter. In addition to the peanut butter chips, you’ll need white chocolate, sweetened condensed milk, butter, and flaky sea salt. That’s it! If you cannot find peanut butter chips at your local grocery store (check the baking aisle), you can buy them online here. Use high-quality white chocolate for this recipe, not white chocolate chips! This recipe requires a double boiler. There are instructions on how to build one in the recipe box below. When melting the ingredients together, have patience! The low heat guarantees the chocolate won’t get gritty. 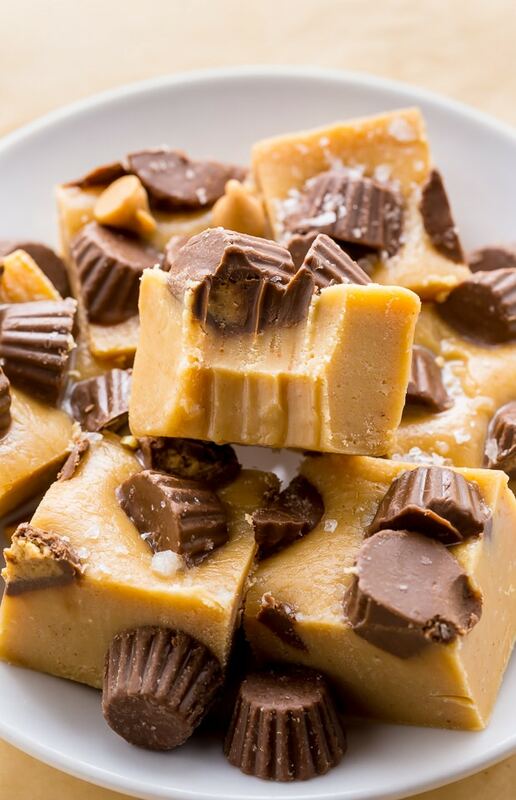 Due to the sweetness of this recipe, I suggest cutting the fudge into very tiny pieces. One batch will go far! I also do not suggest this recipe for those who like bittersweet or mildly sweet desserts, as this one is full on SWEET. 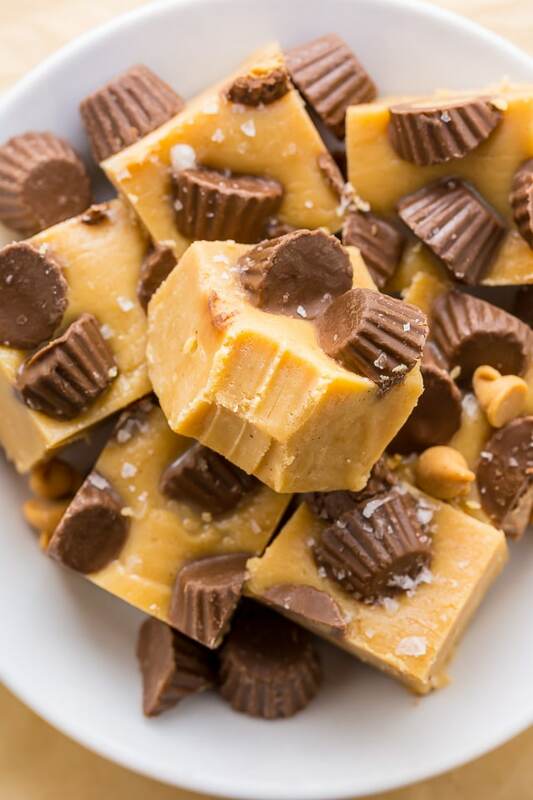 I love topping this easy peanut butter fudge with flaky sea salt and mini peanut butter cups, but this is totally optional. The fudge will need at least two hours to set, so be sure to plan ahead time wise. 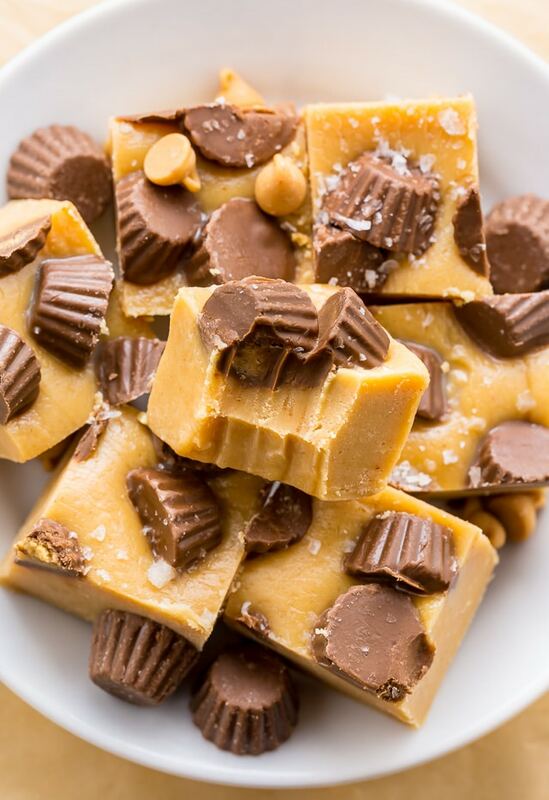 A foolproof recipe for easy peanut butter fudge! Perfect for edible gifts. Lightly grease an 8 x 8-inch baking pan. Line the pan with parchment paper, allowing the excess paper to overhang the sides. Grease the paper and any exposed pan with butter and set aside. In a large, heatproof bowl combine the sweetened condensed milk, white chocolate, peanut butter chips, and butter; set aside. Fill a saucepan with a little water (you want it about 1/4 full) and bring it to a boil. Reduce the heat to barely a simmer. Place your heatproof glass bowl holding your ingredients on top of the pot. Stir frequently, until the white chocolate and peanut butter chips have melted and the mixture is completely smooth, about 10 - 12 minutes. Remove from heat. The mixture will be very thick! Using a sturdy spatula, scrape the fudge into the prepared pan and smooth the top. Sprinkle with sea salt and press on a few mini peanut butter cups, if using. Refrigerate for at least 2 hours. Allow the fudge to rest at room temperature for at least 10 minutes before cutting. Then gently run a butter knife around the edge of the pan to loosen the fudge. Remove the fudge and transfer it to a cutting board. 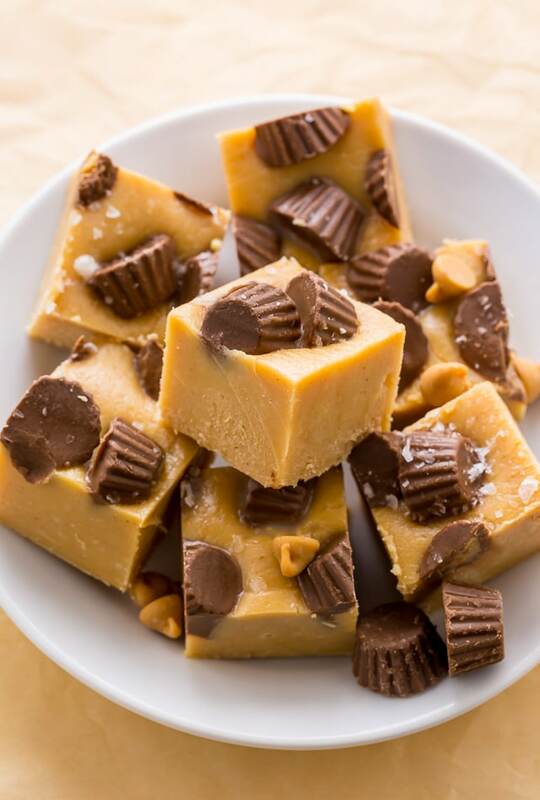 Peel off parchment paper, then slice the fudge into small pieces. 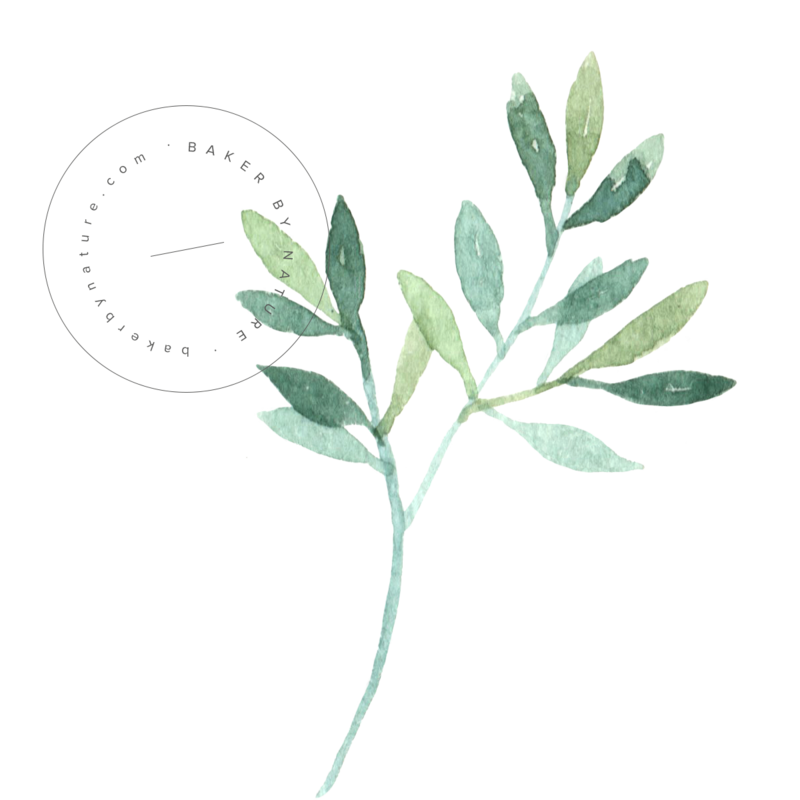 Serve at once or store in the refrigerator for up to 1 month. You may also freeze the fudge, in an airtight freezer safe container for up to two months. My sons favorite! I made this yesterday and he liked it so much! can it be microwaved, instead?